Tobago feels much more African than the sister island of Trinidad, though they both lie just off the coast of Venezuela. Most of Tobago's best beaches can be found on the Western side. This is also where you will find many of the best places to stay on Tobago - a collection of hotels, guesthouses and diving lodges which occupy lovely sandy coves. The coral reefs of Nylon Pool with shallow, shelving waters and the mountainous, rainforest covered interior make this a great place for a low-key but adventurous Caribbean break. Tobago welcomes tourists with little fuss to a beautiful, peaceful island with plenty of natural assets and little development. There are some relatively plush hotels and also tiny guesthouses. Shoes seem to be optional at both ends of the scale. Scarborough is Tobago's largest town and a good base. If you are looking for a tropical beach break then head for the Southwest coast. To explore the underwater world consider staying in a tiny fishing village. Tobago also has a number of forts and plantation houses if you are interested in the history of the place. Take a glass-bottomed boat out to Nylon Pool where you can go snorkelling to explore the diverse array of local marine life. With music blasting from the boat's speakers and a jovial atmosphere, it is always an extremely fun time! If you are here for the beaches, and there are many of them, consider spending an afternoon at the picturesque Pigeon Point Beach or the uncrowded yet scenic Englishman's Bay. Nature-lovers will be thrilled hiking through the stunning Tobago Forest Reserve filled with a wide variety of exotic birds. The lush tropical interior is home to a huge array of wildlife. To lear more about the island's history then be sure to visit Fort King George. Boasting a museum, brimming with a range of artefacts, telling the history of the island. The Hotel Guru's pick of the best places to stay in Tobago range from a great value three star option to a luxury villa resort with spectacular ocean views. Bacolet Beach Club is a whitewashed 20-room hotel perched above a secluded beach. The contemporary rooms with balconies face either the azure waters of the ocean or the pool. The food is good and the atmosphere is relaxed. The Seahorse Inn is set back from a lovely beach and offers accommodation in rooms, suites or three bed villas - some with four-poster beds and private balconies. With a pool and restaurant there is also a fitness centre. Prices here start from just £88 per night. 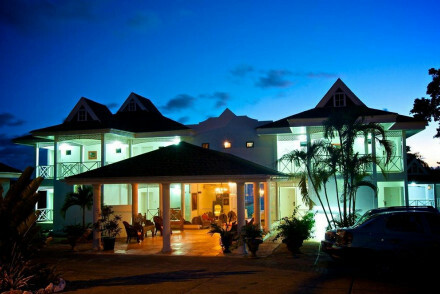 Blue Waters Inn is another very family-friendly option offering one, two and three bedroom apartments with kitchenette and veranda. Just a short stroll from the beach, there is a lovely pool, bar area and tennis courts. Not bad for under £100 per night. 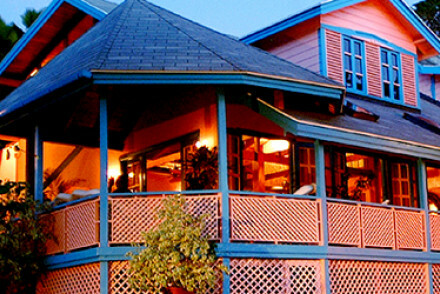 Half Moon Blue is a nine room hotel overlooking Bacelot Bay - and with views as far as Trinidad on a clear day. Rooms and facilities are much better than you'd expect from a three star property. Excellent value, with rooms starting from just £70 per night. 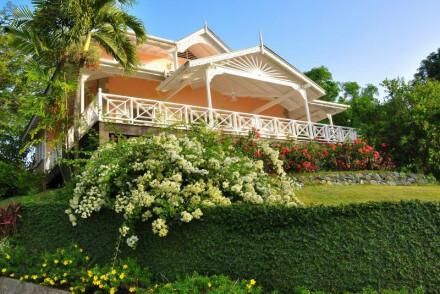 The Plantation Beach Villas are a collection of six colonial villas, sleeping up to six, surrounded by lush gardens. Each villa has direct beach access, BBQs and babysitters. There is the option of a private chef! Great watersports facilities on the beach. Tennis and golf facilities are close by. Another luxurious resort at Black Rock, The Villas at Stonehaven are a collection of larger villas all with kitchenettes, living areas and patios. Classical and romantic, the hotel has stunning views. If you'd prefer the privacy of a self-catering option then browse through the wide variety available online with our partner,Booking.com. Tobago is never cold with the island average temperature hovering from 25-27°C year-round!. But be aware that hurricane and tropical storm season runs from June to November. Visitors can fly into the A. N. R. Robinson International Airport located on the southwest corner of the island. For car hire we recommend you visit our online partner Rentalcars. Browse though our list of all the best places to stay on Tobago. Expand your search to include all our Caribbean recommendations. An excellent three star option overlooking Bacolet Bay. Charming rooms have four poster beds, balconies, and DVD players. Beautiful pool and bar area, restaurant, and easy access to the beach below. Family friendly and excellent value. Views - Amazing views as far as Trinidad on a clear day. Swimming Pool - Outdoor infinity pool with great views. Sights nearby - Fort King George. 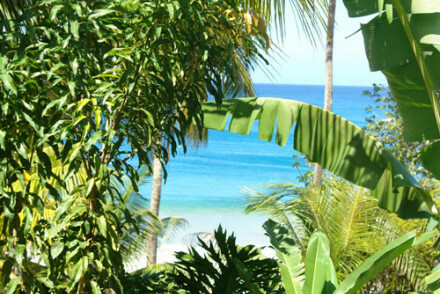 A laid back inn directly on the beach with stunning ocean views and cocooned by palm trees. Creole/international restaurant and lots of relaxation areas. Excellent value. Views - Views straight out to sea. 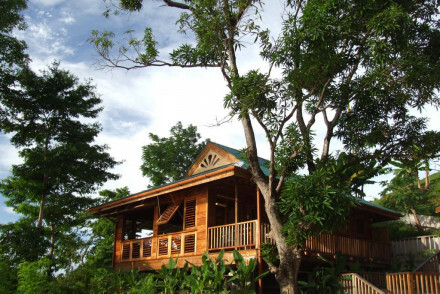 A wonderfully laid back set of eco-lodges in the picture perfect fishing village of Castara. Rustic-chic self catering apartments offer simple and elegant interiors, wood floors and unbelievable views. The restaurant is excellent, but you are encouraged to eat out and experience the village. Birdwatching - Sit on your terrace and listen to the birdsong, there are over 75 species in your garden alone! A very Caribbean hotel perched above a beach. A white washed building focused around its pool and azure ocean view. Contemporary rooms have balconies and all the mod cons. A secluded beach moments away, good food, and relaxed atmosphere. Family friendly, good value too. Views - Spectacular views from the property's hillside location. A charming hotel just above Speyside beach with a collection of sea-facing bungalows. One, two, and three bedroom accommodations come with kitchenettes and verandahs, each in beach chic style. Lovely pool and bar area, tennis court, and a walk onto the beach. Family friendly, good value. Diving - Fantastic dive sites very close by. Birdwatching - Plenty to see in the hotel grounds, but a visit to Bird of Paradise Island can be arranged. 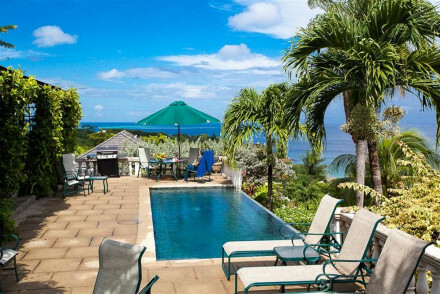 Just six beautiful colonial villas, each sleeping six, with luscious gardens, private chef, and fully equipped kitchens. Ideal for families or groups of friends. Excellent access to plenty of water sports, golf, tennis, and direct access to the beach. A special spot with an iconic atmosphere. Families - Six colonial style villas with kitchens, BBQS, babysitters, and a daily housekeeper (sleep 6). A luxury villa resort with sumptuous suites equipped with kitchenettes, living areas, and patios. Traditional chic in style with romantic linens, four poster beds, and classical furnishings. Lovely pool, restaurant, massages, BBQ grills, stunning ocean views. Sophisticated and romantic. Swimming Pool - Outdoor half moon infinity pool beside the restaurant. 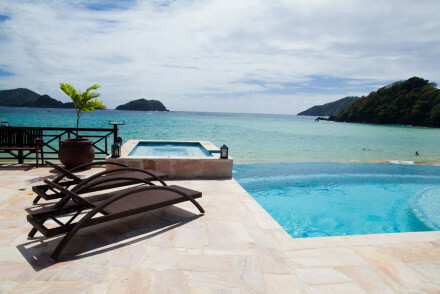 Each villa has a private infinity pool & pool deck.